For at least a year I've been shooting video auditions for my students with a GIANT curtain hanging in the middle of my studio. The curtain was a little wrinkled… and the set up was way annoying. When OCSA (Orange County School of the Arts) auditions were happening, I would just leave it up year round. 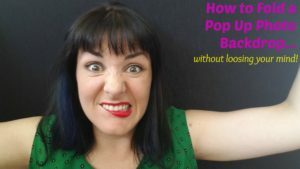 I saw an add for this new pop up back drop and I literally freaked out. It looked sooo simple and super easy for traveling. And, it honestly amazing. Super light weight and looks great on camera when you want a solid clean backdrop. However, I have managed to fold myself into some pretty interesting positions while trying to fold this thing back into it's super sleek carrying case. Soooo – as usual – I took my failure and turned it into a lesson for you! Ha! I did a Facebook live video today showing you the easiest way to fold this puppy up in 2 seconds flat!